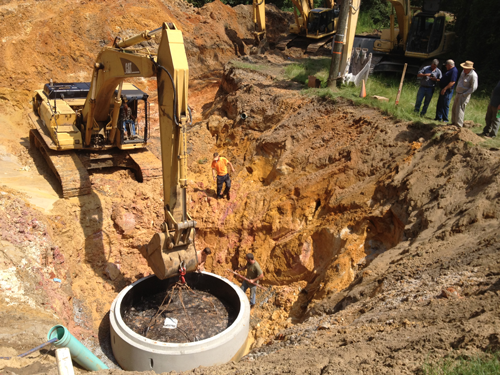 PARKER Engineering provided the design and bidding documents for the rehabilitation of 4559 LF of sewer main in the City of Sylvania. Video reports of the existing clay sewer mains revealed cracking and deterioration that provided entry points for roots. The residents of this neighborhood were being troubled with sewer stoppage, slow-flushing toilets, and sewage surfacing due to the roots and the aging infrastructure. Also the City lift station was overpowered during large rain events due to the large amounts of infiltration entering the sewage system. The excess groundwater in the sewage system was also creating hardships at the waste water treatment plant; the City was paying to treat clean groundwater. 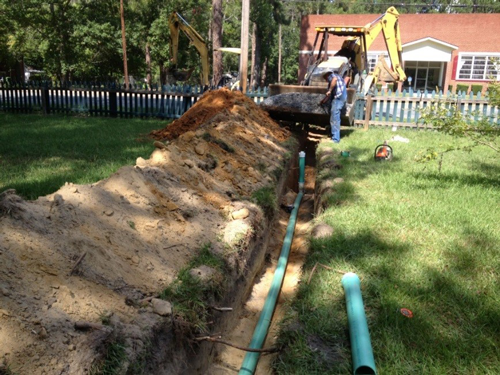 The rehabilitation consisted of replacing all of the leaky clay pipes with HDPE (plastic) pipes. 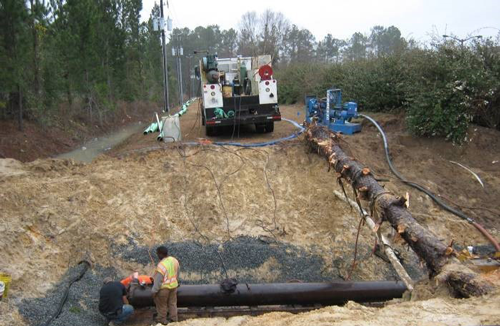 The pipes were replaced using a trenchless method called “pipe bursting”. Pipe bursting works by inserting a pneumatic bursting head into the sewer main. Attached to the head is several hundred feet of HDPE pipe fused together. As the bursting head shatters the clay pipe it pulls the HDPE pipe into the void to replace it and create a leak tight sewer main. All clay service laterals to the houses were also removed and replaced with PVC lines and all leaking manholes were rehabilitated using a cement material. In 2009, the City of Millen was economically distressed due to several factories and manufacturing plants that were shut down during the global economic collapse. 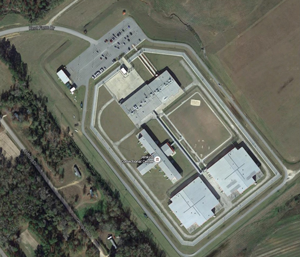 In 2010, the City received good news: A prison was announced to be built in the City of Millen that would house 1,750 prisoners and employ approximately 400 people. Unfortunately, the City’s sewage infrastructure was inadequate for the operation of this prison. Parker Engineering worked with the CSRA Regional Commission to secure grant funding from the State of Georgia and the US Department of Commerce. Parker Engineering also designed a 1.25-mile trunk line to transport sewage from the proposed prison to the treatment plant on the opposite side of town. The existing lift stations at the treatment plant were also inadequate for this prison. Parker Engineering designed a lift station capable of pumping 1,500 gallons per minute to serve the prison population. 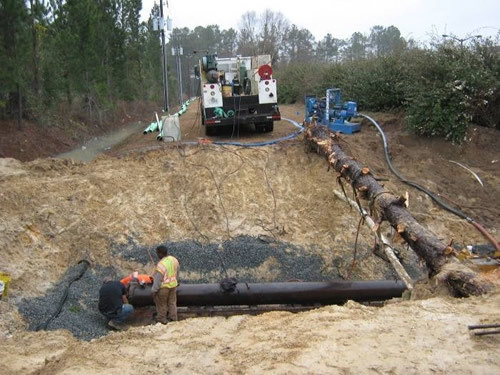 PARKER Engineering in conjunction with Thomas & Hutton, provided the design and bidding documents for the construction of 3257 LF of sewer main in the City of Springfield. 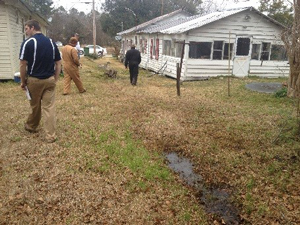 The residents of this neighborhood were experiencing sewage backups, slow‐flushing toilets and raw sewage flowing in their yards due to septic system failures. 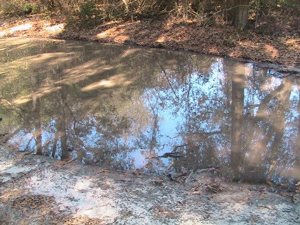 The septic tanks were failing during wet weather when the groundwater entered the septic drain fields. The resident’s problems were solved by the design and construction of a sewer extension to the affected neighborhood. The pipe was jack and bored underneath Highway 21 Business and the Norfolk South Railroad. All houses were connected to the new main and all septic tanks were filled in or removed. The residents now have a dependable sewage system.